As a second year captain, Destiny is a valuable asset to the Tech Cheerleaders. Destiny truly encompasses what it means to be a leader. Not only is she knowledgeable in the sport; but she is dedicated to the team as a whole. It is evident that she genuinely cares about her teammates and she is always willing to help them succeed. Her talent, personality and enthusiasm will be missed next year. 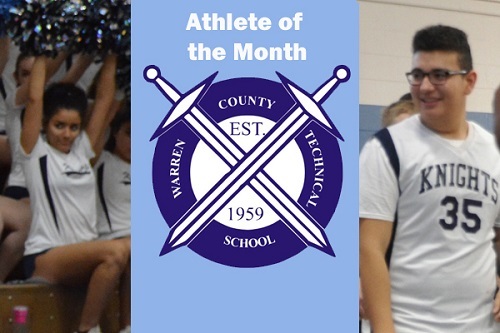 The player that receives the athlete of the month for January is Juan Pineda who plays for the JV basketball team. This student athlete shows great character on and off the court. Juan is very successful in the classroom which transitions well to learning the game of basketball. This is Juan's first time playing organized basketball and he also helps other teammates learn the playbook. His hard work and determination is a perfect example of a great student athlete.